Donald Trump: populist? fascist? Neither. Jan-Werner Mueller has written an excellent editorial for Al Jazeera America, entitled “Trump is a far right populist, not a fascist.” I like this analysis because it goes into a few distinct and important areas when talking about politics, especially to an American audience. Essentially, it’s an attempt to counter the easy ‘fascist’ descriptor with something more rooted in history and ideology. While the term ‘populist’ has a progressive connotation in the United States, in Europe is applied to race-baiting demagogues like Marine Le Pen of the National Front in France. Populism itself is not an ideology. It’s an approach to politics, relying on relating to the struggles of the common people and rallying them towards a goal. This goal can be anything- Bernie Sanders and Donald Trump can both be considered populists in their anti-establishment stance. In the late 19th century, the People’s Party gained traction by stirring up farmers to oppose urban finance capital that exploited them. All the variation in populism comes from who the villain is. For the Trump campaign, Latinos were the initial target. Now it’s expanded to Muslims, both groups being linked by their ‘foreignness’. Trump appeals to poor whites, the same who have been behind the spike in popularity of far-right groups like the National Front, along with Golden Dawn in Greece and the Danish People’s Party. As with populism itself, “people’s party” reflects tactics rather than ideology. But calling the Trump campaign populist is problematic. On the surface level, his rhetoric fits the bill. Yet the entire structure of the campaign is different. American populism grew at the grassroots level- it was a bunch of broke common people up against a small clique of bankers and politicians that created this inequity in the first place. Zach Carter is right to deem him a ‘plutocrat populist.’ I don’t think of Teddy Roosevelt and Huey Long when Trump floats into conversation. I think of Charles Foster Kane, a man who has profited from exploitation and claims that as experience for office. His campaign apparatus has been slow in becoming anything other than a planning team for rallies. In populist fashion he stirs up his followers, but their zeal doesn’t carry. Big turnout, yes, but a noncommittal base. There has been no effort to change this; for a front-running campaign there is no systemic gathering of data and follow-up. What makes supporters of populist parties and figures distinct is their commitment above and beyond the normal politics of voting. In America, they battled the banks over monetary policy, and many fought and died in labor actions against mining and timber interests. 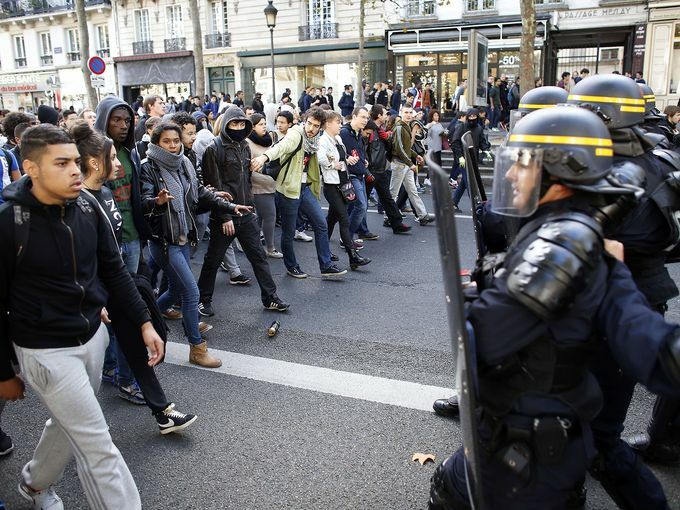 Far-right supporters in Europe often engage in street protests and sometimes open conflict with political opponents. Despite the left and right selling very different ideas of what a just society is, and who is keeping it unjust, populism creates rabid followers. I don’t recognize what we call populism at anything beyond a surface level. Even with mass support, this is still a Trump vanity campaign. His political shifts haven’t been justified by new experiences or ideas. Right-wing rhetoric is just the easiest way to get noticed- especially in a Republican Party that lacks high-caliber figures that could steal the spotlight. Thus just like ‘populist,’ the label ‘fascist’ also falters beyond a surface basis. Yes, in Italy and Germany there was physical violence between true believers and the opposition. Xenophobia was strong then and continues to be. Be that as it may, fascist ideology was complex and sophisticated, and those that crafted it were serious about everything they said and did. Trump’s politics are scattershot and shallow- the xenophobia is present, but it’s not directed in any way. I don’t get the feeling that if he was elected, the fascist-seeming aspects of his stump speeches would be formalized and put into law. Some people advocate extreme ideology because they believe mainstream politics has failed and radical measures must be taken to reforge society. Others use it to gain attention and power, because they are no different in mindset than the discredited mainstream. Trump seems to be the latter. So I take a third option on who Donald Trump is in this election cycle. His campaign isn’t the work of common people at all, and while his nominally populist outlook draws big crowds, it hasn’t created the warriors for the cause. While Trump rallies do often resemble fascism, or something just as odious, there isn’t any ideas about the role of the state and the nation. Trump is a consummate opportunist who taps into the energy of an alienated white working class, but not for any larger purpose. Populists, then and now, used these tactics to further a particular cause. Movements were populist and then something else. He is just one shade of the fallout from gridlock and corruption in the mainstream. Hollow demagogues have the same opportunity to harness popular anger as everyone else. Author Andrew MackayPosted on December 29, 2015 December 29, 2015 Categories Capitalism, Politics, RaceTags 2016 election, al jazeera america, campaign, Charles Foster Kane, democratic party, donald trump, far right, fascism, fascist, france, Germany, Italy, Jan-Werner Mueller, Marine Le Pen, National Front, Nazis, People's Party, political mainstream, populism, populist, progressive, republican party, trump, trump 2016, Zach CarterLeave a comment on Donald Trump: populist? fascist? Neither. Presently I’m reading How the Scots Invented the Modern World by Arthur Herman. Originally I bought it as a present for my dad, chosen from Barnes & Noble because our symbolic ethnicity is Scottish, and it seemed like an interesting read. He finished it, so I stole it to read on my second trip north towards Canada. Elaborate traditional opening of the Scottish Parliament. One interesting aspect of the book is on the dirty, depressing method by which England and Scotland became united in 1707. Scotland, which was mostly out of the colonial game and among the poorest European countries, scraped together a bunch of money for what was called the Darien Scheme. In retrospect it was a terrible idea- it was already well-established that Europeans couldn’t survive in the tropics, the land was unpopulated but claimed by the Spanish, even though it was decades after Jamestown it still had the issues with colonists and cargo not being particularly useful. Scotland tapped out and joined the English rather than attempt to create their own international commerce system. That’s interesting, particularly in light of the (not terribly likely to pass) independence referendum in six weeks. The origins of modern states are often messy and unpleasant; it’s why the modern concept of the nation was created. Leaders could rewrite history and craft a new, artificial culture. It helps to distract from how many countries, European and former colonies alike, exist due to treaty negotiations. The glorious struggle is often more like the tedious administrative wrangling. What fascinates me about nationalism is how the recent can become the arcane and sacred in the minds of millions. Almost everyone probably thinks that French has been the dominant language in France for a very long time. After all, it’s called France. But until the last 150 years or so, a vast majority of citizens spoke little to no French. 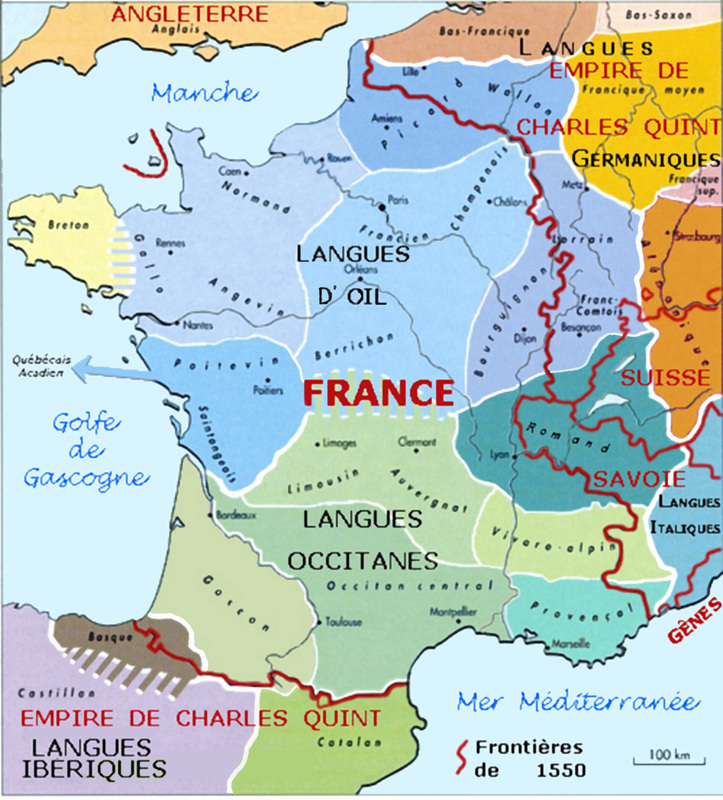 The various languages in France and their extent, 1550 CE. European history, as taught to me in the main high school textbook, was about how Latin was a language of the church and elite, and the big shift was to vernacular languages. This did happen, but the truth of the matter is that the big modern tongues we think of were far less influential than they are today. In fact, the rise of unified, centralized education was needed to demote languages like Occitan to secondary importance. Just like how you could say that man made god, man made the nation. Traditionally both religion and nationhood have a sort of holy feeling, and a sense of destiny. In America, there is often a blurring between the Founding Fathers and the Framers as men, or as deities. If the independence referendum fails, the reasons will go beyond pragmatic economic and political concerns. Part of it will be how a British identity has been fashioned. The marvel of the modern world is not how violent and destructive it is, but how countries that spent most of the last millennium trying to kill each other don’t anymore. For every Yugoslavia, where one identity became many, there are others were a disunited region became one. What I’m trying to say in the end is that there are many histories. We tend to believe the dominant explanation of the past. That doesn’t mean it’s a good picture. For all its flaws, A People’s History of the United States was an attempt to disrupt the American mythology. Such work may be a sort of inconvenient truth- what ends up in textbooks and classroom lectures usually works, for some group of people. French high schoolers marched in solidarity with Leonarda Dibrani, a Roma girl who was detained by police during a school trip and deported with her family to Kosovo. Dibrani is one of many young individuals sent to her “home” country- despite not speaking any of the local languages, and not having any friends or contacts there. 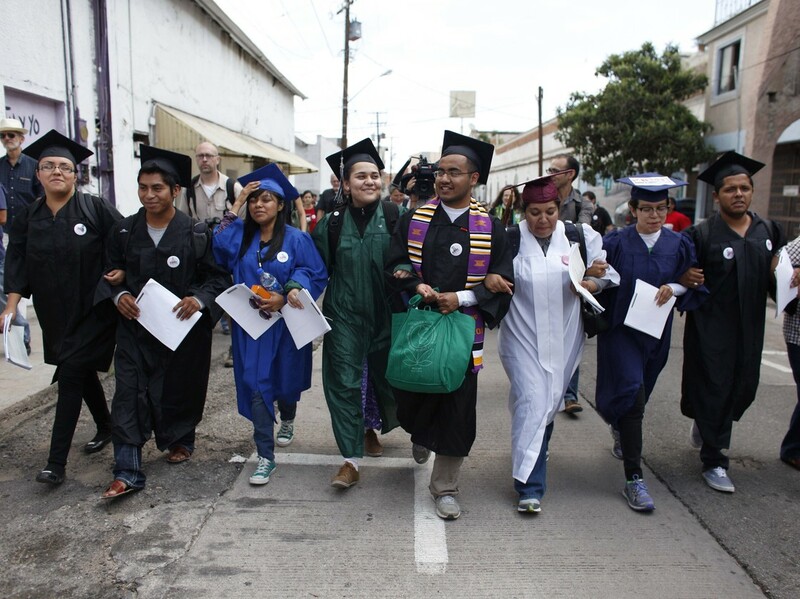 Along with the Dream 8 (or 9), activists born in Mexico but raised in the United States who were arrested trying to cross the border north, these are clear examples of how immigration and citizenship are getting the way of the lives of people who don’t fit the mould. The huge quantity of deportations (which remains high, the majority of which are non-criminals) under the Obama administration includes many people who have no strong ties to their home country. Taking functional members of society, who are important members in their families and communities, and throwing them into another country with no support is barbaric.